Join a Kenya safari for an exciting exploration of one of the world’s famous game reserve in the world, Maasai Mara Game Reserve. From exciting game drives to embracing the unique and authentic way of how the Maasai people live, you will definitely get an enriching experience through this safari journey. Maasai Mara Game Reserve is an area of preserved savannah wilderness in southwestern Kenya along the Tanzanian border. Perfect Safaris considers it their responsibility to provide you with the means to have a wonderful safari in Kenya with an opportunity to experience spotting the Big Five. Come and explore the beauty of Maasai Mara Game Reserve has to offer! You will be accommodated at Lenchada Tourist Camp. At 08:00, you will be picked up from your Nairobi Hotel and commence the drive to Maasai Mara Game Reserve via the Great Rift Valley viewpoint where you will have a breathtaking view of the floor of the rift valley. Lunch will be in Narok Town on the way to Maasai Mara Game Reserve. In the afternoon after you check in, you will depart for a game viewing drive in the Maasai Mara Game Reserve. Thereafter, you will return back to the camp for a sumptuous buffet dinner ending with a good time for resting at Lenchada Tourist Camp. Maasai Mara Game Reserve is the most popular tourism destination in Kenya located in the Great Rift Valley in a primarily open grassland. Wildlife is most concentrated on the reserve’s western escarpment. Its regarded as the jewel of Kenya’s wildlife viewing areas. The annual wildebeest’s migration alone involves over 1.5 million animals arriving in July and departing in November. Hardly can a visitor miss to spot the Big Five. The phenomenal wildebeest migration which is a spectacular event only seen in Maasai Mara Game Reserve is the wonder of the world. You will spend the full day exploring Maasai Mara Game Reserve in search of the Big Five. You will also have picnic lunches in the reserve as you scale Mara's beauty sitted at the banks of Mara River. It is in the Mara that perhaps the most spectacular event of the natural world takes place which is the Great Migration. This is the annual migration of millions of wildebeests and zebras from the Serengeti (in Tanzania) in search of water and pasture. Following on their heels are the predators of the savannah such as lions, cheetahs, jackals, hyenas, and vultures. 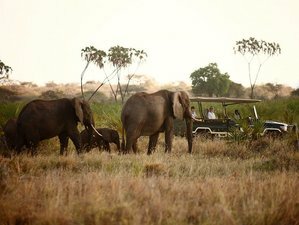 You will enjoy the last early morning game drive in Maasai Mara Game Reserve followed by breakfast. Thereafter, you will drive back to Nairobi. On arrival, you will be dropped at your hotel in Nairobi. This marks will be the end of the tour. Perfect Safaris will hope you really enjoyed your trip. This safari trip will take place in Maasai Mara Game Reserve, Kenya. The Maasai Mara is a large game reserve in the south-west Kenya. The name is derived from the Maasai people and the Mara River which divides it into eastern and western parts. The extensive savannah grassland in between the rolling hills hosts a large variety of wild animals. Every year, about 2.5 million wildebeests and hundred thousands of zebras wander through the Masai Mara between the months of June and October on their Great Migration between the Serengeti National Park in Tanzania and Masai Mara in Kenya. This spectacle has recently been declared the seventh natural world wonder. Masai Mara is a permanent home to lions, leopards, cheetahs, black rhinos, elephants, buffaloes, hippos, crocodiles, giraffes, antelopes, and around 400 species of birds among many others. Wildebeests traverse its plains during their annual migration. The landscape has grassy plains and rolling hills and is crossed by the Mara and Talek rivers. The area nearby is dotted with villages (enkangs) of Maasai people. It is named after the Maasai people (the traditional inhabitants of the area) and their description of the area when looked at from afar, “Mara”, which is Maa (Maasai language) for “spotted,” an apt description for the circles of trees, scrub, savanna, and cloud shadows that mark the area. On day two in the evening, you can visit the local Masai Village for a Masai cultural tour at an additional cost of 10 USD. You will learn about the Masai community and interact with the local Masai people. A balloon safari at a discounted price of 380 USD per person can also be organized in the early morning on this day and then you will proceed with the normal program. Please book your flight to arrive at Jomo Kenyatta International Airport (NBO). Transfer from and to this airport is available upon request. Pickup or drop off at the airport is at an extra small fee of 20 USD.